Tennessee opens the season on Aug. 31 against Chuckie Keeton and Utah State. KNOXVILLE, Tennessee — Early lines on eight Tennessee games indicate that Las Vegas oddsmakers have little optimism for the Vols in 2014. Tennessee opponents are favored in seven of the eight games released by the Golden Nugget as part of their annual early lines. Interestingly, roughly one-fourth of the 200 games handicapped by the Golden Nugget had line movements after their initial release to reflect betting trends. But only one Tennessee game was adjusted: Georgia is now favored by 16 points, down from 17. In other words, it doesn’t appear the public is flocking to bet on Tennessee. Of course, UT will likely be favored in the four games not listed. If you’re inclined to optimism, think of it this way: The Vols must only steal only one upset after winning the five games in which they will be favored to become bowl eligible. If you’re inclined to pessimism, the rest of this blog is for you. A 19-point spread translates to a 2.7 percent chance of winning against Oklahoma. Or just an 11.45 percent chance at Georgia. For the sake of this simulation, we’ll give UT a 6.5-point edge against Utah State and an 8-point advantage against Arkansas State and Kentucky. We’re giving the Vols a 99.95 percent chance of victory against Chattanooga. That’s a 32 percent chance of winning at least six games and making a bowl, a 31 percent chance of having the same record as last year and a 37 percent chance of being worse. I’ll update the simulator with new numbers as the season goes on. Think some of the odds are way off? Let me know. This entry was posted in SEC football, Tennessee football and tagged Alabama Crimson Tide, Arkansas State Red Wolves, fepo, Georgia Bulldogs, Golden Nugget, lines, odds, Oklahoma Sooners, Ole Miss Rebels, South Carolina Gamecocks, Utah State Aggies on June 16, 2014 by Evan Woodbery. KNOXVILLE, Tennessee — Quinten Dormady came to Knoxville over the weekend for what he thought be the first of many stops on a college tour through the South. But when Tennessee made it clear that he not only had an offer, but it was an offer that coaches wanted — and needed — him to decide on soon, Dormady scaled back his decision to just two teams: Alabama and UT. The decision gives the Vols a second quarterback in the 2015 class. (And Jauan Jennings has insisted that he is a quarterback, not an athlete or a safety). Dormady’s arrival will also help replenish the depth at quarterback after Riley Ferguson‘s recent decision to transfer. Justin Worley will graduate after this season, leaving only Joshua Dobbs, Nathan Peterman and whoever UT signs in this class on the 2015 roster. Given those numbers, and the questions about Jenning’s ultimate college position, could the Vols sneak a third quarterback into this class? It might be tough (or impossible) to snare another elite quarterback with two other potential competitors already committed. But maybe a late addition just before Signing Day? A late surprise (like Dobbs)? Or maybe even a wildcard from the junior college ranks? There’s plenty of time left until February. Stay tuned. This entry was posted in Recruiting, Tennessee football and tagged Alabama Crimson Tide, Jauan Jennings, Justin Worley, quarterbacks, Quinten Dormady, Riley Ferguson on June 9, 2014 by Evan Woodbery. KNOXVILLE, Tennessee — Tennessee coach Butch Jones said his main concern about the future of SEC scheduling was preserving the Vols’ annual rivalry game against Alabama. In that sense, the plan announced this week was a victory. Tennessee athletic director Dave Hart had favored a nine-game conference schedule, but SEC presidents voted to stick with the current plan of six games against divisional opponents, one game against a permanent cross-divisional rival and one game against a rotating cross-divisional opponent. Jones said he recognized there were complications to either an eight-game or nine-game plan. He’s just happy the final plan preserved the Alabama series. This entry was posted in SEC football, Tennessee football and tagged Alabama Crimson Tide, Butch Jones, Dave Hart, DNA on April 30, 2014 by Evan Woodbery. KNOXVILLE, Tennessee — The potential Tennessee-West Virginia football game at Charlotte in 2018 that was reportedly close to being “finalized” four weeks ago has yet to be announced. Tennessee athletic director Dave Hart declined to comment on the report or the potential game in an interview this week with the News Sentinel’s Ben Frederickson. Any future neutral site game, Hart said, would be announced when the contract is completed. Regardless, the Vols-Mountaineers matchup — if it takes place — would fit the profile of games that Hart is seeking. But the recent decision by the SEC presidents to maintain the current schedule format should have little impact on UT’s scheduling goals. Tennessee, like most SEC schools, already schedules one high-profile non-conference game each year. That “high-profile” game will essentially become a league mandate in 2016, when every SEC team will be required to schedule one game against a team from the Big Ten, Big 12, Pac 12 or ACC. Hart, who has favored a nine-game conference schedule, didn’t win that battle. But he was pleased that the league “reaffirmed” its commitment to traditional cross-divisional rivalries like Tennessee-Alabama and Georgia-Auburn. This entry was posted in SEC football, Tennessee football and tagged Alabama Crimson Tide, Charlotte, Dave Hart, SEC schedules, West Virginia Mountaineers on April 29, 2014 by Evan Woodbery. KNOXVILLE, Tennessee — When Lane Kiffin returns to Neyland Stadium on Oct. 25 as Alabama’s offensive coordinator, there is likely to be a swarm of media interest. But current Vols coach Butch Jones had nothing but good things to say about Kiffin, who was UT’s head coach for one season in 2009 before leaving for Southern California. Jones noted that virtually no one on Tennessee’s roster has a connection to Kiffin or his staff. Last year, there were several seniors recruited by Kiffin. Most of Finebaum’s interview with Jones covered well-charted ground, but Jones did offer some candor when quizzed about fan expectations for 2014. Jones said he wants to work at a place with high expectations. Jones closed the interview by calling it an “honor and privilege” to talk to Finebaum, who is a UT graduate and Memphis native. This entry was posted in SEC football, Tennessee football and tagged Alabama Crimson Tide, Butch Jones, Lane Kiffin, Paul Finebaum on April 3, 2014 by Evan Woodbery. A national view of SEC recruiting midpoints. See the maps below for zoomed-in versions. KNOXVILLE, Tennessee — Most SEC schools keep their focus close to home when signing recruits. That’s why the number of top prospects nearby is such an accurate predictor of a team’s success. Consider this map a sneak peek of a story I’m working on for later in the month. I charted the high school of each recruit signed by an SEC school to produce the “geographic midpoint” for each team and the league as a whole. The results weren’t that startling. 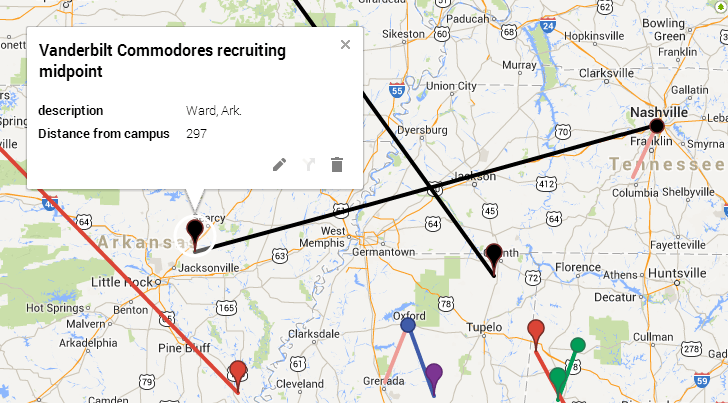 Collectively, the midpoint of every SEC prospect signed in 2014 was near Fayette, Ala., only about 45 miles south of the geographic midpoint of all 14 SEC campuses in Haleyville, Ala.
Only three teams travel a great distance from their home base, and I bet you could have guessed them before I charted this map: Missouri, Arkansas and Vanderbilt. Vanderbilt added a handful of California prospects, which pushed its midpoint west. Vanderbilt was much more pronounced because new coach Derek Mason added some California recruits and lost some in-state signees. Although the Vols continue to recruit nationally, the midpoint of the class hasn’t been this close to Knoxville in years. What about the Vols? As we’ve written before, Tennessee has moved north under coach Butch Jones, but the new midpoint is in line with the SEC average. 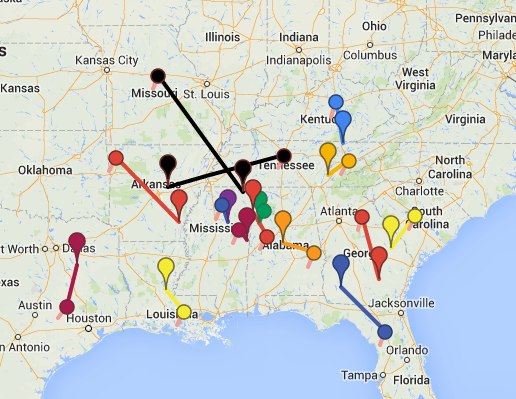 (That little pink line on the map points to the “expected midpoint” for each team based on the SEC average). What schools are outliers, compared to the rest of the league? Obviously Arkansas, Missouri and Vandy have to recruit nationally out of necessity. Both Arkansas and Missouri recruit aggressively in south Florida, which pushes their midpoint south and east. Texas A&M and LSU, generally, stick to their own fertile territories without spending too much time fighting others in Atlanta or Florida. That’s reflected in their midpoints. Alabama recruits nationally despite its talent-rich state, and prospects from Iowa, Colorado and Minnesota helped push the Tide’s midpoint north this year. 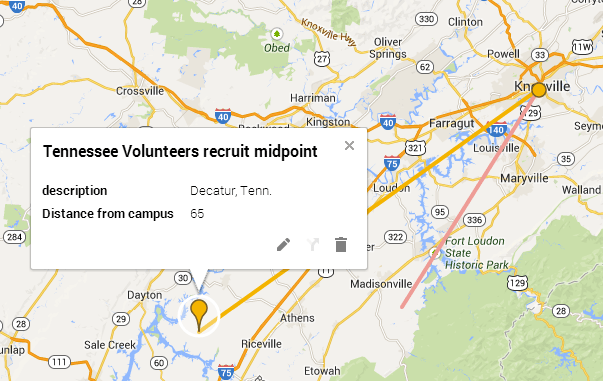 The green map marker circled in white is Fayette, Ala., the geographic midpoint of every SEC recruit signed in 2014. That’s only 45 miles southwest of Haleyville, Ala., (the green circle), which is the geographic midpoint of all 14 SEC campuses. 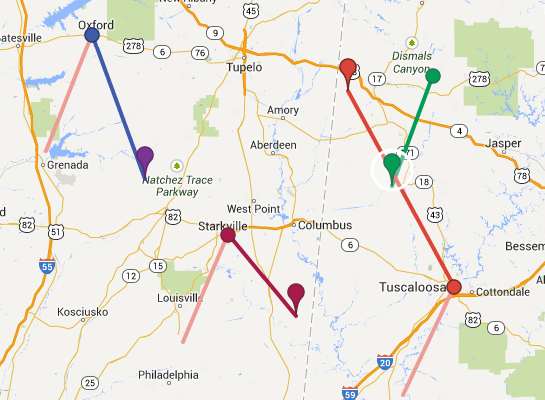 Both Ole Miss and Mississippi State have nearby midpoints. The Bulldogs’ midpoint is in Macon, Miss., which is just 38 miles from Starkville. I thought this was interesting: Florida and Georgia have very similar recruiting midpoints. The Gators did have plenty of south Florida recruits, but their 2014 class had much more of a national flavor than you might expect. Recruits from Brooklyn, N.Y., and Wyoming pushed the midpoint north and west. Georgia, meanwhile, had a smaller class (after signing more than 30 last year) and had a strong south Florida presence. (You’ll recall that Tennessee didn’t sign a south Florida prospect for the first time in five years). * Even for a conference in the southeast corner of the United States, most teams still push even further south. * Texas A&M and Missouri have expanded the geographic boundaries of the conference, but the Aggies rule Texas and don’t have to venture far from there. * Next to Texas A&M, LSU has the strongest commitment to owning its home base. * Even teams with strong local bases have a balanced national recruiting strategy. * If you cover recruiting in the southeast, you should buy a house in Fayette, Ala.
Any other stuff I missed? Let me know. This entry was posted in Recruiting, SEC football, Tennessee football and tagged Alabama Crimson Tide, Arkansas Razorbacks, Butch Jones, Derek Mason, geographic midpoint, Georgia Bulldogs, LSU Tigers, Mississippi State Bulldogs, Missouri Tigers, Ole Miss Rebels, Texas A&M Aggies, Vanderbilt Commodores on February 17, 2014 by Evan Woodbery. KNOXVILLE, Tennessee — Now that National Signing Day is in the books, let’s take a step back and look at recruiting in the SEC over the last four years. These are the players — if they’re still around — who will have the greatest impact on a team’s success in 2014. The numbers don’t lie: Alabama has dominated the recruiting game just as it has on the field. That’s not a surprise. But Tennessee’s ranking relative to the league average might be better than many expected. We used the 247Sports Composite rankings in order to get a broad perspective from all the major recruiting services. We also wanted to go beyond a simple ranking to see the relative strength of each class as it compared to the rest of the league. 1. Tennessee’s recruiting ratings are above the league average over the last four years both collectively and individually. The Vols have been above the league average in three of the last four years. 2. On the negative side, the Vols suffered serious attrition in the 2012 class. Some of it was natural (Cordarrelle Patterson) but there were also plenty of washouts. Also, some of the higher rated players from 2011 and 2012 simply haven’t lived up to expectations. 3. Florida, despite last year’s debacle, still has plenty of talent. If they can fix a few issues from 2013, they could be right back in the title race. 4. Auburn can still lean on several solid classes and has every reason to expect to be in the mix for the SEC championship again. 5. Texas A&M has put together three consecutive solid classes that should help mitigate the departure of Johnny Manziel. 6. The bottom of the conference is largely what you would expect. Despite recent improvements in recruiting from Kentucky and Vanderbilt, relative to the rest of the league, their ratings are still low. 7. Missouri’s recruiting may not be impressive on paper, but it’s worth remember that the Tigers won the SEC East in 2013 using classes that were ranked near the bottom of the league. Mizzou’s case, of course, is why factors like retention and development and coaching still matter. But if we were to judge the 2014 season solely by its inputs, here’s what the standings would look like. Just for fun, we’ll use the four-year relative score (with 100 being average) and give 10 points to the home team in each game. It would be hard to imagine Missouri and Vanderbilt plummeting so quickly, but I wouldn’t be surprised to see Florida make a dramatic rebound. Before you prepare your hate mail, remember this is just a “fun” excercise that does not necessarily reflect my actual opinion, nor does it have any effect on the real world. This entry was posted in Recruiting, SEC football, Tennessee football and tagged Alabama Crimson Tide, Class of 2011, Class of 2012, Class of 2013, Class of 2014, Florida Gators, South Carolina Gamecocks on February 6, 2014 by Evan Woodbery. KNOXVILLE, Tennessee — Jarran Reed, one of Tennessee’s top remaining targets, is off the board. He tweeted today that he has committed to Alabama: “Want to thank God and everyone but my decision is final I will be joining Alabama…I’m committed to Tide Roll Tide Roll,” he said. Reed originally signed with Florida but failed to qualify out of high school and enrolled at East Mississippi Community College. The 6-foot-4 , 310-pound defensive tackle is considered an immediate impact player. The Vols are losing two senior tackles from an already thin interior defensive line. Tennessee hopes to receive better news when receiver prospect Josh Malone makes his announcement at noon today. This entry was posted in Recruiting, SEC football, Tennessee football and tagged Alabama Crimson Tide, Class of 2014, defensive tackles, Jarran Reed on December 4, 2013 by Evan Woodbery. KNOXVILLE, Tennessee — The Vols are headed to Alabama for their showdown with the No. 1 Crimson Tide. The game kicks off at 3:30 p.m. and will be televised by CBS. Most lines have Tennessee as a 28.5-point underdog. The final video is new team member Ben Frederickson‘s debut on our weekly Double Coverage segment. If you have any questions or topics you want us to cover on future segments, just let me know by email or Twitter. This entry was posted in Tennessee football and tagged #GVXTV, Alabama Crimson Tide, Ben Frederickson, Bruce Pearl, Butch Jones, Devrin Young, Double Coverage, GVX Spotlight, GVX TV, Josh Smith, the red team on October 25, 2013 by Evan Woodbery.